Rialto Bridge (Italian: Ponte di Rialto) is one of the four bridges spanning the Grand Canal in Venice. 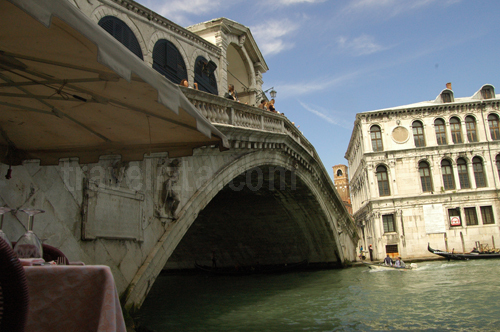 This bridge is the longest bridge, and halves the district of San Marco and San Polo. At first, this area shaped bridge "pontoon", built in 1181 by Nicolo Barattieri, and called "Ponte della Moneta". Antonio da Ponte designed the stone bridge that we see today in 1591. The shape is similar to the design of the existing timber, by the meeting of two "ramp" with adjoining portico. On the second ramp built a row of shops. Technically, the bridge with a length of 28.8 meters was called by the architect Vincenzo Scamozzi frail, and in the prediction could collapse again in the future. The bridge answers criticism now, where it stands majestically up and became an icon of Venice. Form of the ancient buildings in Venice are basically the same as building design in other old towns in Europe, made from thick plaster stone walls with timber framed window and ornamented in classic-style. All of these elements are design to acclimatize and store heat during the four seasons that occur there. Windows are usually made with two layers, on the front is made of wood material with a butterfly-shaped fighting jalousie, and the inside using glass, still adorned with hanging potted plants that dot the facade of the building. Despite being on the streets and narrow alleys, space limitations do not make the owner bereft of ideas and creativity to make the building look green and fresh. The biggest bridge in the city, the Rialto Bridge, is our next destination.